I am interested in the trend of hipster shamanism that seemed especially predominant over a year ago. Some incarnations of that aesthetic are present in the music of Animal Collective and (at least the music videos of) MGMT. Strains of it crop up in other areas as well: there was something resonant in Where The Wild Things Are, and certainly the moccasins, deer antlers, crystals and howling wolf t-shirts. On the one hand I take the movement somewhat seriously as an effort to overcome a predominant sense of irony. On the other the gesture seems doomed to fail–because it is always located in the self or the mystical subjective, and thus cannot transcend the self. While the following essay does not directly talk about the existence of that trend, it does try to suss out its significance–at least in one instance. 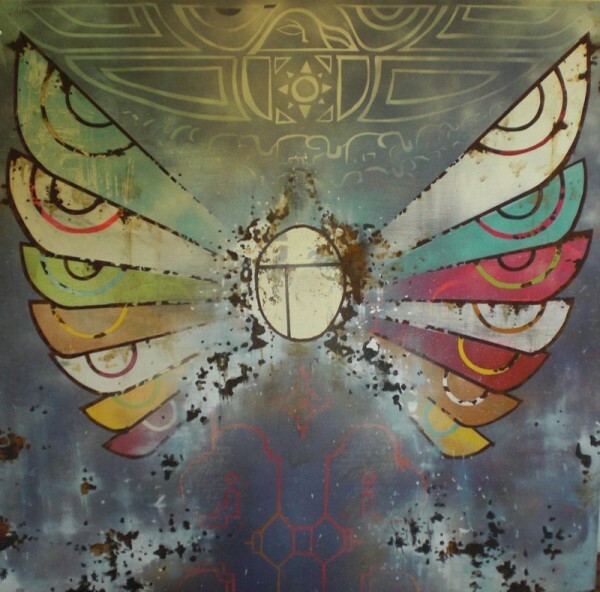 This summer shamanism was the subject of an exhibition at an apartment gallery in Wicker Park. By way of contemporary accident, I happened onto a TV show on the History channel, in which a young man travels the world collecting tattoos on his body. The premise of the show allowed for a rudimentary understanding of the cultural contexts surrounding various tattoo traditions, from the Maori in New Zealand, to the Hawaiian warrior, to Japanese tattoosâ€™ relationship to Yakuza and, even farther back, public shaming techniques that marked the criminal. Each of those traditions and techniques was discussed as the reality-TV-protagonist procured a tattoo from every respective culture. In each instance the tattoo originally marked a rite of passage by which the newly inked individual was initiated into a particular community. By contrast, the TV-protagonist was more or less an American tourist whose enthusiasm had been subsidized by a large network to purchase the right to participate the signs of ritualistic practice. His position is obviously problematic. It was also a pretty interesting show. I began to think about the tattoo as an object, a practice adopted by mainstream American culture, a culture that has no unified ritualistic context with which to consistently codify the tattoo. 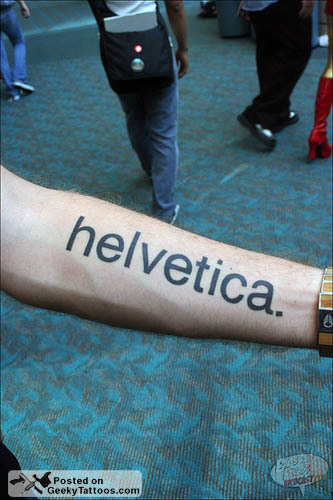 Instead the tattoo commemorates a subjective moment/aesthetic. Whether one gets a Bambi tattoo, a name in cursive, a Celtic symbol, a Sailor Jerry throwback, or a flock of birdsâ€”the choice is largely arbitrary outside of a super-personal realm, save for its capacity to demonstrate socio-economic and cultural class. Oddly enough, my mind followed a similar path when I went to visit Johalla Projectâ€™s show Whoâ€™s Yr Shaman? (August 13-September 3rd, 2010). Within the premise of the exhibit, there is a well-articulated intent to illustrate the spiritualistic practices of individual artists represented in the show. While appreciative of the exhibited work and its difficult subject (I think it’s interesting how religion is a taboo subject in contemporary art), I could not help stumbling over the phrasing of its premise. I was confused about how â€œshamanâ€ was being used. It seemed part of, if not synonymous with, â€œmystic,â€ â€œmagicâ€ and â€œspiritualityâ€â€”terms I feel are distinct while lacking the knowledge to define their differences. Nevertheless the umbrella notion of a â€œshamanâ€ seemed like something I could think about and I was excited to have the chance to do so. Can a contemporary American have a shaman? Do we have the structure in our society to support that relationship? Do we even want that relationship? As I understand it, the shaman functions as an individual in service to a community. That individual, while often self-elected (and thus most often outside the cannon of a major religion) is proven by way of rigorous ritualistic practice, as well as his or her leadership capacity. The shaman functions as a very practical leader (who assists community disputes or day-to-day problems), as well a healer (both in physical and mental/emotional realms), while also connecting a particular community to its historical heritage through ritual and storytelling. The shaman does not simply afford super-personal relationships. As a community teacher (for lack of a better word), he or she is in control of implementing and facilitating ritual, whatever that may be. As such those community participants donâ€™t have, (what to me feels like a particularly American trait), the ability to participate in some of the ritual but ignore others. To buy into this aspect of shamanic practice (i.e. taking psychedelics) but not another aspect (i.e. fasting). In her book Peyote Hunt Anthropologist Barbara Myerhoff describes an experience she had in the 1970s while traveling with a Huichol maraâ€™kame (shaman) to â€œhuntâ€ Peyote. She describes a remarkable experience. Every year people within the maraâ€™kameâ€™s community are invited to accompany him on a journey to collect a yearâ€™s worth of peyote. In a highly ritualized process, the maraâ€™kame takes his people back to the country of their origin. After riding a bus for several hours, they get out at the start of a desert. There they tie a string in a series of knotsâ€”one knot for every participating â€œpilgrimâ€â€”to signify the way these people are joined in their journey. At this stage each pilgrim must confess anything which they are ashamed of having done in the last year (or since their last peyote hunt). They are renamed, blindfolded, blessed with water and then, when the maraâ€™kame removes the blindfold, each person beholds the sacred world of origin (Wirikuta). â€œOn the peyote hunt, we change the names of things because when we cross over there, in Wirikuta, things are so sacred that all is reversed,â€ (Myerhoff, p.148). The maraâ€™kame calls human hair cactus hair. Water is called tequila. The gringa (in this case Myerhoff) is called a Huichol. All pilgrims must observe the new assignment of nouns over the ensuing days, causing everyone to participate in constant mental acrobatics–word games which nevertheless force the relationship and identity of objects to be reconsidered. They eat, sleep and drink as little as possible. They walk through a series of canyons in single file and anyone who has to relieve themselves does so discretelyâ€”as though to pretend, Myerhoff suggests, that they have become deities beyond physical need. The journey is obviously rigorous and the maraâ€™kame is constantly fearful for the souls of his pilgrims which seem to be in great peril. In addition he describes the first man, the order of their gods etc. He has ultimate control over the situation. I bring this up as a tangible example, partly to illustrate a â€œrealâ€ shaman, but also to highlight the stress and, even, danger tied to ritualistic ordeal. Whoâ€™s YR Shaman is not really about shamanism at all. Itâ€™s about different responses to the idea of spirituality as an opportunity for artistic research. It is about a mystical subjective. In this way too it differs from the original claim of the curatorial statement that relates this body of contemporary work to religious artwork created in Medieval times. Rather than speak to a codified canon of, say, Christianity, the works contained interpretingÂ spiritual influence differently. For the most part the interpretation was ultra personal. Whatever suggested transformation was primarily in relation to the â€œIâ€ and thus difficult, if not impossible, to measure. If you say this crystal is deeply significant to you; if you say it transports you to another dimension, and if you seem convinced by that conclusion, I cannot dispute your claims–even if touching your crystal does not have the same affect on me. Consequently the foundation for an already risky premise was so subjective as to be unstable. It was difficult, therefore to avoid a sense of irony. Dream catchers and feathers have been so laden with hipster-cred that it is just about impossible to divorce them from that bag of cultural association. Chad Harrison built shrines to a collection of objects he keeps in his studio that facilitate his creative process. While I can imagine Harrison might object, his totems make suspect any claim of earnestness, (especially the dubious, ceramic Native American caricature with droopy pants). Another piece by Ivan Lozano is dedicated to Laurence Weiner with a pyramid of plastic snow (or cocaineâ€”I thought of cocaine, anyway), fitted between VHS boxes on top of a mirror, with a TV set playing the words â€œDo you believe in water?â€ In this piece, the artist references historical art heroes as spirits that might inspire or somehow rub off on his own career. William Henri Pisarri After Halcyon and Ceyx by Rebecca Walz feels like a memorial/alter of loss made in lieu of the death of a friend. There were mannequins in dresses sewn by Sara Fagala. Embedded in the outfits were magic crystals that boasted therapeutic powersâ€”perhaps suggesting it was the dress that was shamanic. I was taken with Elijah Bergerâ€™s delicate color-penciled drawings of two young men, knifing one anotherâ€™s naked bodies with occult-like symbols. Here too the artist’s studio is present although in this instance it is the set for a marginalized form of ritual. Terence Hannamâ€™s video and gouache paintings of dark rooms and amplifiers, explore the cult of rock and roll. The amplifier is the elevating principle, through which an audience is transported. A separate room contained the work of Adam Ludwig: big paintings, another dream catcher/drum and an alter with a halo of feathers. 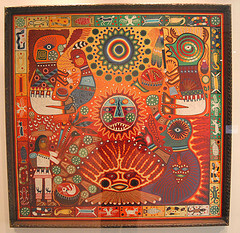 These works reference alchemy and symbols which, to me, resemble the yarn paintings of the Huichol Indians. In Ludwigâ€™s work, the surface of the canvas is deteriorated and rusty, perhaps suggesting that incorporating/recreating old traditions is difficult, if not impossible. These latter works were most compelling to me, within the criteria described by the curator. Whoâ€™s Yr Shaman? asks for a level of sincerity which, while not incongruous with all the work, was incongruous with its title. As a result, the show dissolved into a display of first-person jaunts into spiritual curiosity. It was unclear, therefore, what was at stake. Nevertheless there was an evident desire to connect with something–a desire to connect and express something metaphysical. Trying to compile that impulse, to curate it into a show or describe it in a body of work is an ambitious and worthwhile endeavor. And you couldn’t call the show “Excercises in Spirituality” because no one would go–at least not the same number of people who would go see “Who’s YR Shaman?” And there again I tug at a question that has been bothering me for a long time now; one I’m not sure I can answer. Are there limits to what histories/traditions/signifiers we can borrow? Does something change when an one tradition is adopted into another? Is America’s hipster-shaman fad more than a trendy handbag? – Peyote Hunt: The Sacred Journey of the Huichol Indians, Barbara G. Myerhoff, Cornell University Press, 1974. – Shamanism in The Age of Reason, James L. Kent, PIT Press, Seattle, 2010.